Chocolate chip cookies are tasty, but they’re seriously lacking in the frosting department. This chocolate chip cake with cream cheese frosting is the answer. The base is part cookie, part cake, and the tangy frosting adds layers of creaminess. Although you’re supposed to let the cake cool completely before frosting it, no judgment if you can’t wait that long. Warm chocolate chip cookie cake sounds pretty darn magical to us. 1. Make the Cake: ﻿Preheat the oven to 350°F. Grease a 9-inch cake pan with nonstick spray. 2. In the bowl of an electric mixer fitted with the paddle attachment, cream the butter, brown sugar and sugar until light and fluffy, about 4 minutes. 4. In a medium bowl, whisk together the flour, baking powder and salt. Add half of the flour mixture to the wet ingredients and mix to incorporate. Add the milk and mix to combine. Add the remaining flour mixture and mix to combine. Fold in the chocolate chips. 5. Pour the batter into the cake pan. Bake until a toothpick inserted into the center comes out clean, 35 to 40 minutes. Cool for 15 minutes inside the pan, then invert onto a cooling rack to cool completely. 6. Make the frosting: In the bowl of an electric mixer fitted with the paddle attachment, cream the cream cheese, butter and confectioners’ sugar until light and fluffy, about 3 minutes. Add the vanilla and mix to combine. 7. Place the cake on a serving platter. Pile the frosting on top and then smooth into an even layer. 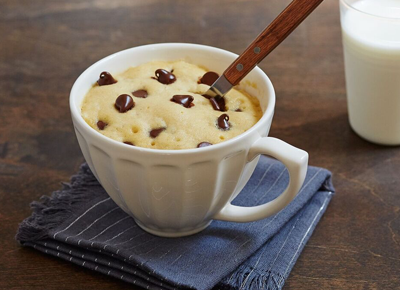 Finish with a sprinkling of chocolate chips.